1965 Bugatti Molsheim Letter - Steering Wheel. 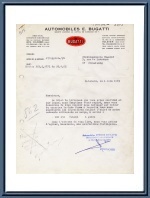 This is an original 1965 Bugatti Molsheim letterhead. It was sent on the first of June, 1965 to Ets. Ungerer in Strasbourg, France to inquire about their order for 1 steering wheel. 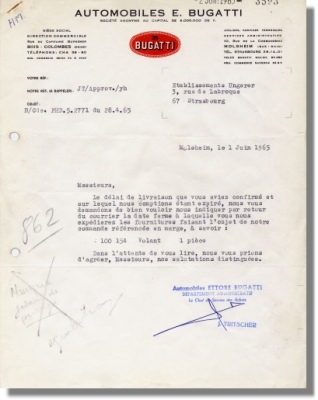 It is signed & stamped by J. Tritscher, Head of Purchasing of Automobiles Ettore Bugatti.